Hillsborough County Sheriff’s Office Community Resource Deputy Jeff Merry said turning in expired, unwanted or unused medications is easy, as shown here. Everything is accepted as is, no questions asked. 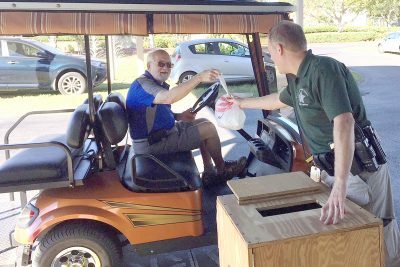 The Hillsborough County Sheriff’s Office and Home Instead Senior Care Brandon is partnering once again to collect your old prescription and over-the-counter meds. Simply turn them in during Operation Medicine Chest from 9 a.m. to noon Dec. 7 at Sun City Center Community Hall, 1910 S. Pebble Beach Blvd., and from 12:30 to 1:30 p.m. in the lobby at Freedom Plaza, 1010 American Eagle Blvd., SCC. 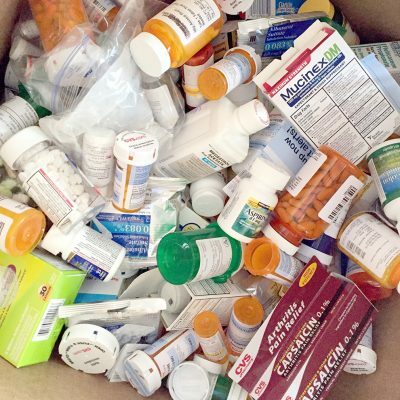 Hosted by the two organizations, the free event enables residents to conveniently and confidentially dispose of unused, unwanted or outdated medications in a safe manner, said HCSO Community Resource Deputy Jeff Merry. Folks generally drop off their meds in boxes or grocery bags; some even hand over loose pills in a storage bag. At Community Hall, they don’t even need to get out of their cars or golf carts. Just under 1,100 pounds were turned in by Sun City Center residents during the two Operation Medicine Chest collections last year. This year’s fall collection will take place Dec. 7 at Community Hall and Freedom Plaza. Deputies closely monitor the entire process. Ultimately, they are incinerated in a 3,000-degree oven, the same one used by the sheriff’s office to destroy illegal drugs and confiscated guns. Operation Medicine Chest has taken place every spring and fall since 2006. Last year, almost 1,100 pounds of medications were collected in Sun City Center alone. Other collections are also held throughout the county. Small amounts of pills or capsules may be dropped off any time at the Hillsborough County Sheriff’s Office Dist. IV Command office, 508 33rd St. S.E., Ruskin. Liquids and sharps are prohibited there. For more information, call 813-629-8869 or email kcampbell@aaxiomhealthservices.com or jmerry@hcso.tampa.fl.us.